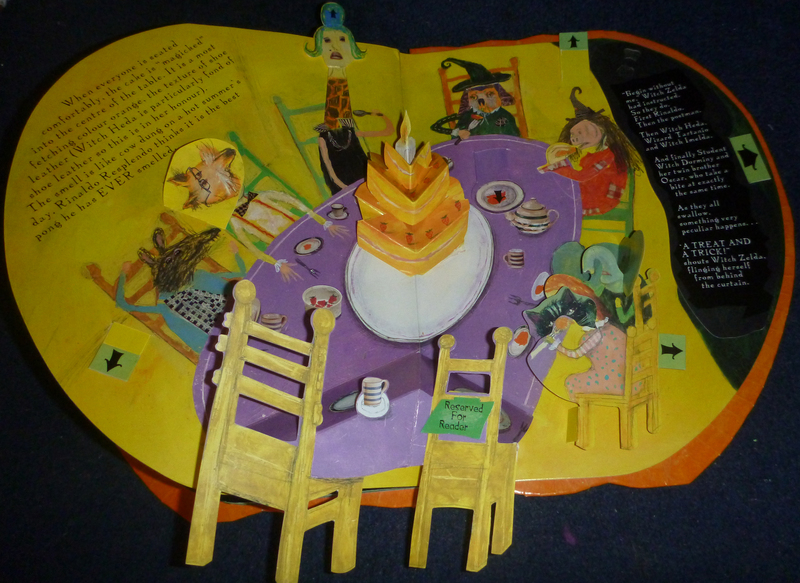 My favourite pop- up book when I was little was ‘Witch Zelda’s Birthday Cake’. This colourful and exciting childrens book was written and illustrated by Eva Tatcheva. The cover of the book is bright orange and the whole book itself is shaped like a pumpkin, keeping with the Halloween theme. I feel the type on the cover could be clearer as I think it is confusing which order to read it in. However I really like the font that is used as it suits the story and style of the book. My favourite part of the cover is that there is a pull- tab pop- up on it. When you pull the tab Witch Zeldas face peeps out from behind the curtains in the window. This is a really clever way of engaging the children straight away and getting them to choose it from the shelf. The very first page is instantly intriguing. 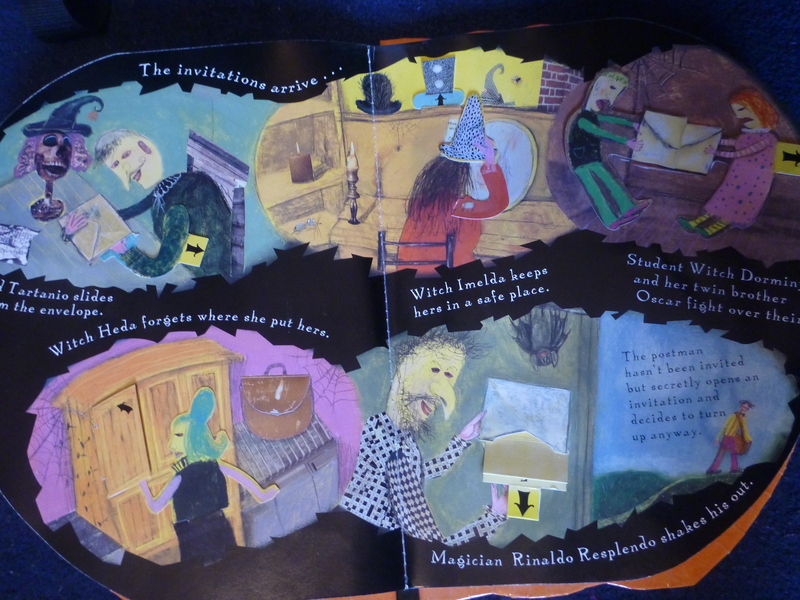 The pop up table with funny contents and chest drawers that open allow the reader to explore Zeldas house. Using materials like reflective foil for the mirror and thread for the telephone cord makes the page very interesting for little children who can actually play with illustrations. Tatcheva makes use of interesting textures and collage throughout the book. This can clearly be seen in the kitchen scene when the chefs are making the birthday cake. The chefs trousers are collaged together from newspaper clippings and the grater is partly photograph. 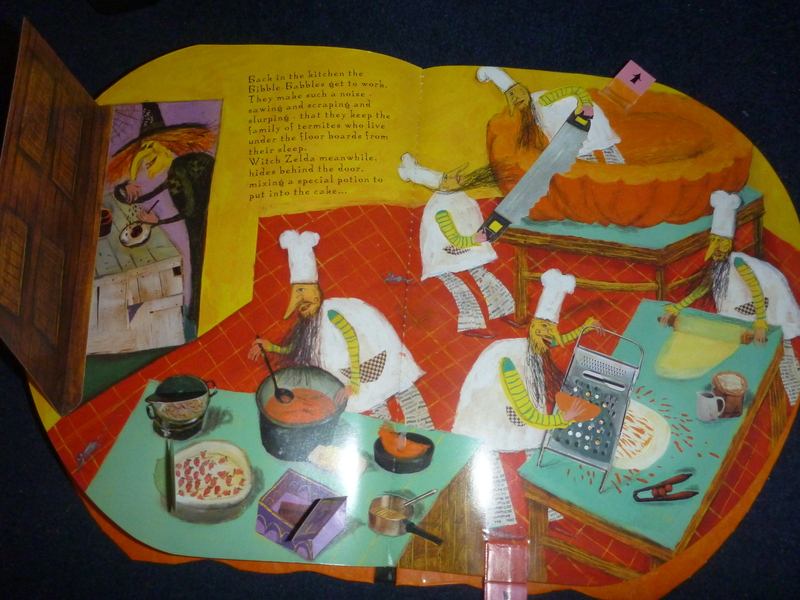 This particular page has 6 pop- up elements, including two of the chefs who you can move to saw the pumpkin up. This page is very exciting visually. Every page is different in terms of colour and composition. One page has cleverly been split up to show all the guests receiving their invitations to Zeldas birthday party. I really like the use of the jagged black frames used to do this and the way the text is laid out around them. Because of the framing it does not matter what order you read it in. The final page is brilliantly designed. It shows the guests all turning into animals having eaten the cake. What I really love about this book is that Eva Tattcheva includes more than one type of pop- up mechanisms on each page. 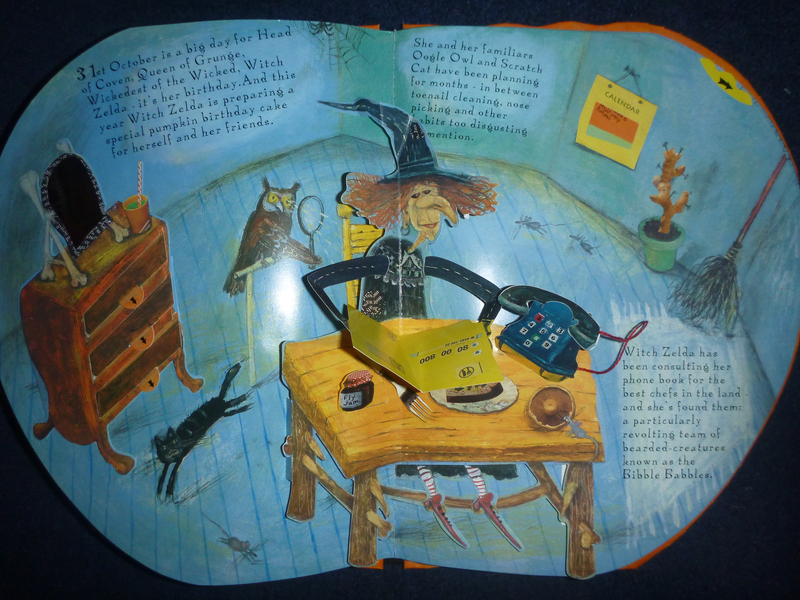 She uses a combination of flaps, pull- tabs, rotating wheels and big pop- up scenes to create an exciting book that is just as much fun to play with as read.